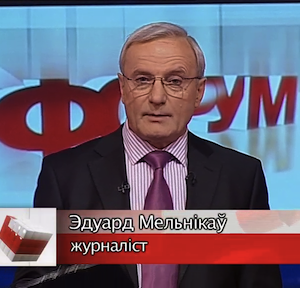 Belarus Digest interviewed Eduard Melnikau, founder of the first independent Belarusian-language TV channel Belsat. Currently he is a Member of Board of the Belarusian Association of Journalists and one of the Belsat program producers. His TV-studio VISATA, based in Lithuania, produces TV programs such as "I Have the Right", Talk Show “Forum" (a co-production with Inforum), "Unknown Belarus” documentaries, and others. We talked about the effectiveness of Belarusian exile media, ways to increase access of Belarusians to independent information, and how to make video products more attractive and Belarusian journalists more prepared. BD: How effective are foreign broadcasts to Belarus? It is difficult to measure and I only know approximate figures for Belsat. According to various estimates there are around 700,000 Belarusians who regularly watch Belsat and around the 400,000 who watch it from time to time. Belsat is particularly popular outside of Minsk. Because people do not have well-developed cable networks, many purchase and install satellite dishes outside of major cities. Other broadcasters such as Euroradio, Radio Liberty and Radio Racyja also have several hundred thousand listeners according to various estimates. Given that the Belarusian population is over nine million people, much more needs to be done. BD: What can be done to improve the reach of independent media? I think the main focus should be on development of content for Internet with a particular emphasis on multimedia products such as video. According to a poll conducted by Genius, in February there were over 1.5 million ADSL users in Belarus. In October the number was already 2 million. The development of the internet is very rapid in Belarus. This is why it is important to encourage development of content, particularly video and audio tailored for internet users. Already television sets can be connected to the internet to watch TV programs and IP television flourishes in many regions of the worls. In my opinion, this should be the main direction of efforts in Belarus. Internet video format means relatively short clips — five to ten minutes which can then be broadcasted on Belsat and uploaded on Youtube. Independent groups can develop multimedia products and then give or sell them to those who can deliver them to the audience. The more competition and diversity between such groups the better. IP television requires investments and technical skills which Belarusians today lack. But the internet may soon replace traditional radio — at first it will supplement it and then can replace it altogether. And this does make sense because media products become more customizable and allow more interaction with the audience. BD: What is happening with Belsat? But because Belsat is a part of Polish state television, that puts certain limitations on its activities. Also, not everybody in Poland is supportive of the Belsat idea. Recently a group of Polish public figures published an open letter in which they stated their opposition to using the Belarusian language on Belsat. Instead, they proposed to use Polish and to focus on Western Belarus which used to be a part of Poland until 1939. Because it is state television, there is often not enough flexibility and serious bureaucracy barriers. Belsat is a state entity of Poland which is funded by the Polish government. Many foreign donors cannot fund a state entity. In addition, as for any state structure, the funds are at times not used effectively; they have no flexibility. This is why I believe that it would better to allocate funds not only to Belsat in principle, but on specific projects, which will be implemented by specific known figures. BD: You said that Internet is becoming more important – how can Belarusian media and donors react to the it? It is very important to support independent multimedia projects – there is a great need for it in Belarus and it is possible to satisfy this need. For instance, a good idea could be to create a series of video clips on various topics before the parliamentary elections in Belarus. Such video could subsequently be uploaded on Youtube, independent media and opposition web sites. These materials would be newsworthy and offer insights into the real life of Belarusians as seen by Belarusians. Not only coverage of political actions and Lukashenka's statements, but also of daily troubles of people, their personal stories. It may sound obvious for the Western audience, but in Belarus there is a serious lack of such materials and of grass-roots journalism. Donors could support independent Belarusian producers and Belsat, radio stations and independent web sites would disseminate this information using their infrastructure. Donors could find and support producers of video content which operate as legal entities on the territory of the European Union. It will be easier to work and to monitor such organisations. Working through entities registered in the European Union would also allow it to be outside of surveillance by the Belarusian security services, but under control of European mechanisms. BD: Do you have other concrete ideas? We have recently prepared a number of programs in the “Belarusian Encyclopedia” cycle aimed at strengthening Belarusian national identity. Ignacy Domeiko, Francisk Skaryna and other famous Belarusians (including figures of the 20th century as well as contemporary figures) are the focus. Belsat is unable to produce this cycle, but I believe it is very important for Belarusians to identify as a European nation and such programs could greatly facilitate this progress. Another idea would be to remind people about the brief period of relative democracy which Belarus enjoyed in the early 1990s. A program cycle titled "Belarus 20 Years Ago" could remind people about the days when Belarus had an independent parliament, media and the rule of law. Many in contemporary Belarus do not remember times when there were active political parties in Belarus with competing agendas and real chances to get into the parliament. That was the period when elections results were not fixed but actually determined by the people. At that time Belarus was visited by Western heads of states such as Bill Clinton and only a decade later it became isolated internationally. It would also show Lukashenka's path to power, that there was a real and massive resistance against the suffocation of democracy in the 1990s. These are important stories to tell which will improve the confidence of Belarusians that one day they can Iive in democracy again. The cycle could consist of 5 minute video stories run in between other Belsat programs. I want to underline that we need healthy competition of such projects supported. Because it is impossible to raise money for such projects in Belarus, they should be supported by international donors. And, as a matter of fact, such projects are not particularly expensive but with the right people and good management they could be truly effective. BD: What else could be done to ensure that Belarusians have access to independent media? It appears to me that these days donors tend to support more seminars, conferences and summer schools. This is very important too because we all experience qualified staff hunger and people need to be trained because such training is often unavailable at the usual institutions in Belarus. Those who work for the state media, even after they leave, act more like riot police than journalists. It is also important for us to raise a new generation of Belarusian journalists. Many journalists today just use the internet to dig up stories and most political news revolves around what Lukashenka said on various topics. Journalists often do not try to look at ordinary people, to what is actually going on in real lives of the majority of Belarusians – their problems, aspirations, hopes and disappointments. In the future I think it is important to increase efforts to train Belarusian journalists and stimulate competition between various producers of internet content. These media products, focused not only on Lukashenka and dictatorship but also on everyday life, could then be actively disseminated on Youtube and social networks as well as though traditional media such as Belsat or independent radio stations. Last Sunday, a thousand Belarusians carrying national flags and wooden crosses marched from central Minsk to the Kurapaty forest. Nearly 100,000 people were shot dead during the Stalin era in Kurapaty. On just one day 74 years ago, more than a hundred representatives of the intellectual elite of Soviet Belarus were also shot dead in the cellars of the Minsk KGB (then known as NKVD) internal prison "Amerikanka”. The archive of the President of the Russian Federation still keeps the list with the names of the 103 residents of Soviet Belarus who were sentenced to death by Joseph Stalin on 15 September 1937 and shot on the night of 29 October 1937. According to some historians, this was the way Stalin's assassins celebrated the day of Lenin's Komsomol – The Communist Union of Youth's anniversary. The victims were Belarusian writers (as many as 22 people), government officials, labor leaders, prominent doctors, teachers, priests, military officers, students and others. Leanid Marakou, who is a researcher of Stalin's repressions in Belarus and an author of the multivolume encyclopedia with biographies of thousands of persecuted intellectuals, has documentary evidence that Soviet authorities repressed more than 600 public and cultural figures of Soviet Belarus in the three autumn months of 1937. In the period from August 1937 to December 1938, known as the "bloody tunnel of death", over 10,000 Belarusian people were killed. Marakou estimates that the NKVD killed or exiled to concentration camps up to 90 percent of Belarusian writers (over 500), 100 percent of priests (around 3000), one in three teachers (around 4,000), around five thousand state officials (engineers, economists, and almost all directors of factories then in Belarus). According to Marakou, "the secret NKVD institutions worked for Stalin in the 1930s. They had already foreseen the huge potential in the geographic location of Belarus by that time". He points out that Bolshevik authorities in Moscow were primarily concerned about the possible independence of Belarus and its separation from the Soviet Union. To avoid this, they destroyed the nation’s intellectual elite and gene pool that had been accumulated over the centuries. Marakou explains that "the characteristic fear, indifference and passivity in Belarusian people today is a result of that genocide." Once a successful businessman, Marakou left his lucrative job to start researching Stalin’s terror 10 years ago when he learned that his uncle – talented Belarusian poet Valery Marakou – died on that terrible night on October 30, 1937. 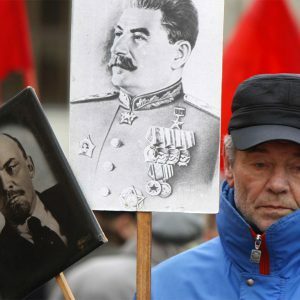 According to the data of another Soviet totalitarianism researcher Ihar Kuznyatsou, between 600,000 and 1,500,000 residents of Soviet Belarus became the victims of Stalin’s repressions and terror: almost every tenth person, every third or fourth family. By official figures, 152,399 criminal cases and 235,552 people were revisited after Stalin's death. 175,914 of the repressed Belarusians were rehabilitated, but 59,638 of the victims were denied rehabilitation. However, it is impossible to count the exact number of repressed people in Soviet Belarus. In today's Belarus, KGB archives are still closed to researchers. Four years ago, prominent scholars and former political prisoners in Minsk organized a public tribunal to deal with the crimes of Stalinism in Belarus. They stated that it was not impossible for the country to become a rule-of-law state without having a fair trial over the communist crimes and criminals. Belarus has commemorated 20 years of its sovereignty this year, but the state under 17-years of Alexander Lukashenka's rule has not even tried to revisit the Soviet past. We witness attempts to rehabilitate Stalin and to level crimes of the Soviet regime in the country that has suffered so much from Stalinism. New high school history textbooks downplay the scale of crimes of the communists. They stress the positive role of Stalin in the historical process. Official propaganda has the same attitude. For instance, in the biographical reference book "The Generals of the State Security of Belarus" (Minsk, 2008), compiled by KGB Major-General Ivan Yurkin, it is claimed that the KGB simply maintained "social order" and "implemented the leading party guidance”. The growth in repressions was explained by the battle within the intelligentsia for whom it was a “quick and effective way to get rid of competitors." In the summer of 2005, the historical and cultural complex "Stalin Line" was opened not far from Zaslawye town near Minsk. On official holidays visitors can observe spectacular combat reconstructions between Soviet and Nazi soldiers. Official ceremonies usually take place next to the monument of Joseph Stalin which was erected there several years ago. Another bloody dictator’s monument was installed in 2000 by the Belarusian authorities in the town of Svislach in Hrodna voblast. It happened almost four decades after a huge Stalin monument was removed from Minsk Central Square as a part of the Khrushchev Thaw. In 2006, a three-meter monument to the founder of the KGB, "the initiator of mass terror, provocation, and the institution of hostages" Felix Dzerzhinsky was raised on the territory of the Minsk Military Academy. The initiator of that memorial was the Chairman of the State Border Guard Service Alexander Paulovski, for whom Dzerzhinsky was a "positive figure in our history." Another monument to Dzerzhinsky has been standing in front of the KGB headquarter in the center of Minsk since the Soviet era. There are more similar stories to tell. Belarus remains the only post-Soviet republic which has kept the ominous name of the KGB without any changes and celebrates officially the day of the October Bolshevik Revolution. In this context, all the events that have taken place after the brutal crackdown of opposition protests on the day of presidential elections on 19 December 2010 in Minsk seem very symptomatic. Lukashenka’s special riot forces arrested dozens of opposition figures, journalists and civic activists, including five presidential candidates. They were thrown into the same "Amerikanka” prison – nowadays the Minsk KGB detention center. If someone thinks that Stalinism is impossible in the 21st century right at the center of Europe, the Belarusian authorities are trying to prove the opposite. The recent amendments to the Belarusian law related to financing of parties and NGOs from abroad, holding mass rallies and expanding powers of the KGB that were introduced in October, are another step in this direction.